Q: What makes blackberries special? The first ripe blackberries from a two year-old thornless blackberry patch in North Philly! 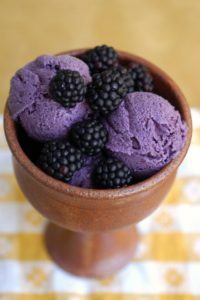 In order to properly research this blog post, a memory refresher of the taste of blackberries was in order! 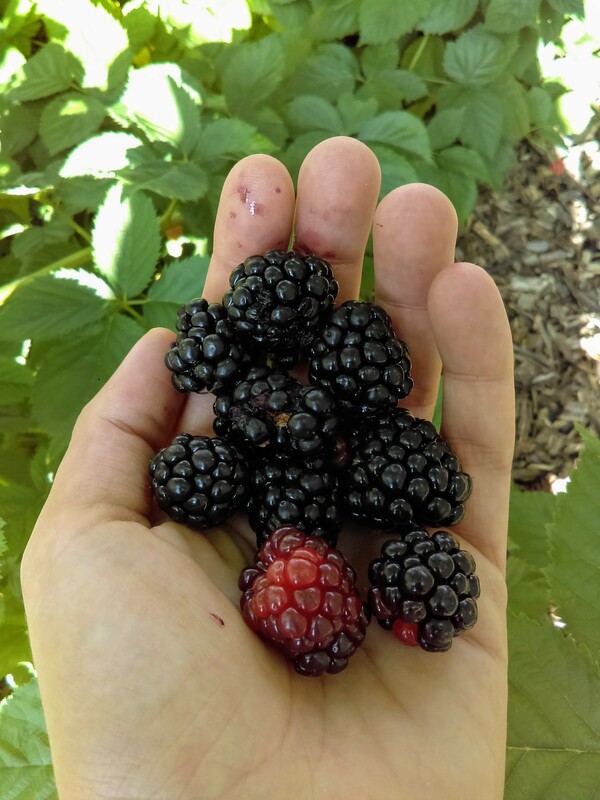 While the organic vegetable farm I work on does have blackberries growing, (mostly as a side enterprise) they are not yet ripe, and so I trekked to the Giant supermarket where they had organic and non-organic blackberries for sale for $4.99/pint. Sheesh! 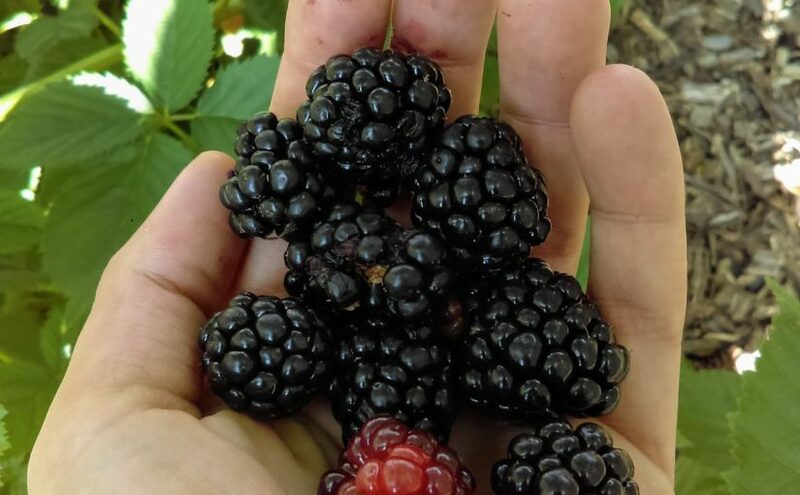 Blackberries are, according to my hands-on research, sometimes sweet, sometimes tart, sometimes sweet and tart, and always delicious! They are juicy and crunchy (from the seeds) and will dye your hands. They are firm to touch (for a berry) and they are extremely elegant. Just look at those beauties!! Mmmm! 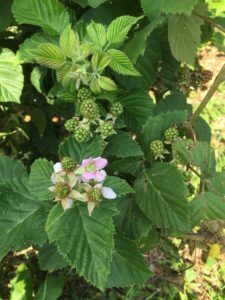 Once I got my taste (and touch) refresher, I decided to explore the nuances of growing blackberries. It turns out, how they are cared for is affected by what type of blackberry plant you have. Is it thornless or thorny? Trailing or Erect? Traditional or Primocane Fruiting? The main difference between thornless and thorny is a matter of having to wear protective gloves when you go to prune or harvest. There are thornless trailing, and thornless erect, there are thorny trailing and thorny erect, all of these are different varieties. The more noticeable difference comes when comparing trailing to erect. Fruits from erect blackberry plants (thornless or thorny) tend be slightly smaller and slightly more bitter. Erect plants are also easier to trellis, in that they don’t need to be trellised at all. Both varieties need to be pruned, and the trailing ones more so because of how long their canes get. More on pruning in a bit. In the image above you can see the trailing vs. erect refers to the growing habit of the “canes”. Canes are, essentially, blackberry stems which emerge from their roots in late spring and summer. That brings us to the 3rd type of different variety – traditional vs. primocane fruiting. Primocanes are the newest, first year growth. Traditional blackberries will not fruit on their primocanes. Rather, they fruit on second year wood (called floricanes), usually in July/August in the Philadelphia area. Primocane Fruiting varieties, as the name indicates, are able to produce fruit on first year growth, usually in the fall. If those canes are left until the next year, they will fruit again on the floricanes in summer, thus producing two crops from the same plant. Unfortunately there are no cultivars that are primocane fruiting, erect, and thornless all together, but I’m sure some plant breeder is working on it! Let’s say you have a thornless, trailing, traditional variety, like the ones on my farm. What can you do to make sure your blackberries are ready to harvest to fullest capacity? If you prune them at the end of their growing season, you’ll do yourself a huge favor! What are you pruning? Not the primocanes, of course, because you want them on the plant next year when they’ll be flowering and fruiting. Floricanes, the canes that flower and produce fruit in any given growing season, should be removed after harvest or anytime before spring of the following growing year. They are easy to tell apart because the floricanes die after they’ve produced fruit, one and done, and the stems turn from green and reddish to grey and brown. If you leave them, they will be in the way moving forward and may even invite disease. Once you removed any dead floricanes, you want to trim the tops of the primocanes in preparation for next year. If it gets too crowded, some of the fruit will not get enough sunlight, air flow, or nutrients. It will also be harder to harvest. 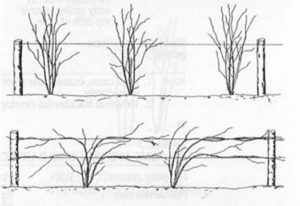 In the winter, when the plant is dormant, you can remove the weakest of the canes and trim the lateral branches, to help strengthen the canes you are keeping. 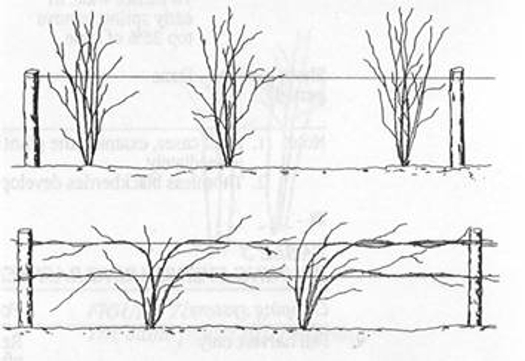 For more pruning specifics, check out POP’s pruning guide for berries, brambles, and vines! Now that your blackberries are nice and dapper, you’re ready to harvest! Harvesting blackberries should be done in the morning after the dew has dried, to prevent the berries from sitting out in the sun. This will give them a longer shelf life. Ripe blackberries will come right off the plant with a gentle tug. You can even roll them off the plant. It is best not to stack them too high on top of one another or you may get some crushed berries on the bottom. If the berry is not fully black (still red or purple in some areas) it isn’t ripe. Once you’ve picked them, put them in a fridge as soon as possible. They should stay for up to a week. Don’t wash them until you’re ready to use them – washing them will make them spoil faster. 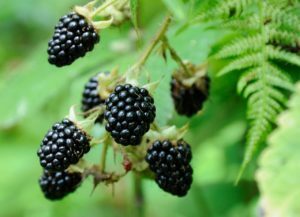 Now that you’ve got your blackberries, you can use them in a variety of ways: scones, jams, add them to your overnight oats, blackberry ricotta pizza with basil, blackberry cheesecake brownies, ice pops, milk shakes, pies, cobblers, crumbles, add them to a salad, blackberry mustard or butter, waffles, fruit roll-ups, fruit salad, blackberry mint julep, blackberry salsa, chutney, tarts, pavlova, blackberry glazed salmon, and lots more! Blackberries are extremely good for you, so it’s important that you eat them in every way possible, including popping them into your mouth raw. Blackberries offer up a sizable portion of vitamins C, A, E, K, and B. They are low in calories and sodium, and they have lots of fiber and antioxidants which help protect against aging, cancer, inflammation, and other neurological diseases. 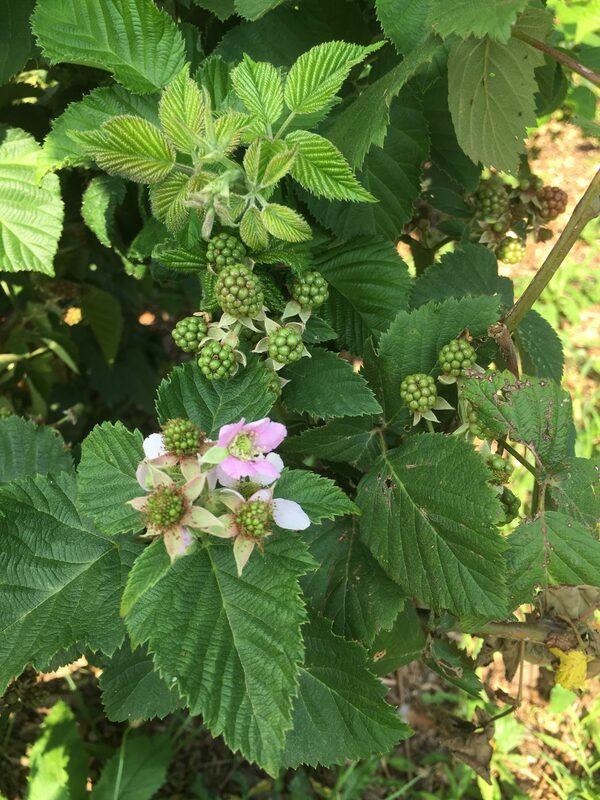 Flowers and young fruits on a thornless blackberry variety. So now you know what makes blackberries special. They’re delicious, low maintenance plants that pack a nutritional punch – what more could you ask for from Mother Nature? This POP Plant Highlight written by POP Volunteer Alex Zaremba.